Gardeners become desperate to salvage their crops as autumn lowers the thermostat. While the daytime temperatures are warm enough to ripen tomatoes, nighttime temperatures threaten developing fruit. These crops aren’t doomed to rot as many backyard horticulturists fear. A few simple steps can be taken to ripen green tomatoes. To determine if the tomatoes from your dying plant will ripen at all, cut one green tomato open and look for a jelly-like substance between the seeds. If it’s there, the other tomatoes from that variety will ripen nicely with these techniques. 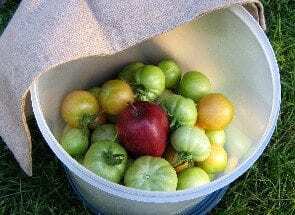 If you see no jelly at all, the tomato won’t ripen, and it’s best just to look for green tomato recipes. 1. Cover your crops at night. A tarp or sheet of plastic can be used to create a mini-greenhouse for developing fruit. Be sure to pinch off any flowers so the plant’s energy goes into ripening the tomatoes. A few rocks can be used to anchor the tarps in place in case of sudden winds. First thing in the morning, remove the tarp to allow the plants to maximize the existing sunlight. 2. Transfer potted plants to a sheltered location. If your tomato plants are already in pots, simply bring them under the cover of a porch every night until the last tomatoes are finally ripe. 3. Uproot tomato plants with dark green fruit. Pull up tomato plants by the roots and shake off excess dirt. Hang the plants, tomatoes and all, upside down in a sheltered area. This will allow the remaining green fruit to ripen to the yellow stage. Yellow tomatoes can be ripened indoors on a windowsill. 4. Ripen tomatoes indoors. Place tomatoes in a container with an apple. Cover the container with a cloth and place it in a warm spot. Tomatoes can be ripened in paper bags as well. Check the tomatoes every day. Remove any fruit that shows any signs of rot. 5. Eat green tomatoes. Lots of recipes ask for green tomatoes. They can be canned or frozen for stews or sauces. Cook them into chili or chop them into a salsa. Green tomatoes are tart like tomatillos and blend nicely with spices.